Micro sized transmitter in a flexible polymer, 2 part splash-proof case. With a replaceable lithium ion rechargeable battery and Lemo connector for a removable lavalier. Frequency adjustable in 25kHz steps. RF output power is user adjustable from 10 to 100mW. 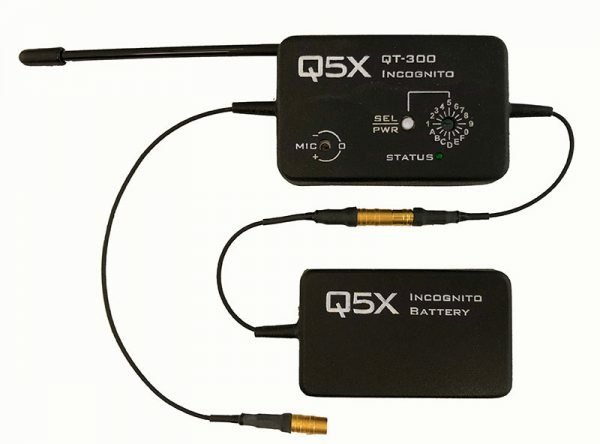 The QT-300® Incognito is a micro sized transmitter in a flexible polymer, 2 part splash-proof case. With a replaceable lithium ion rechargeable battery and Lemo connector for a removable lavalier this is one of the world’s smallest broadcast quality audio transmitters. With the 2 part configuration, it’s easy to conceal and comfortable to wear; actors adore it. Originally designed for theater, the QT-300® Incognito can take the abuse. It is housed in flexible rubber, all components are of the highest quality with custom mini connectors. This commitment to quality ensures the extreme durability and reliability that Q5X transmitters are renowned for. Q5X leads the industry with the latest battery technology available. Get 4, 8, or 12 hours on a single charge with our new selection of rechargeable detachable lithium ion battery options. In addition to being environmentally friendly, the rechargeable lithium ion battery can represent a significant cost savings over replacement batteries. The 3,000 frequencies of the QT-300® Incognito are selectable from 525-600 MHz. It provides high quality broadcast audio with user programmable settings from 10-100mW. Lavalier microphones from Countryman, DPA, Sanken, Voice Technologies can be hand terminated at Q5X with a high quality quick release single pin Lemo connection. The QT-300® Incognito is designed to work flawlessly with the Q5X series of receivers: QR-2100, QR-3200 (wide-band) and QR-M3.